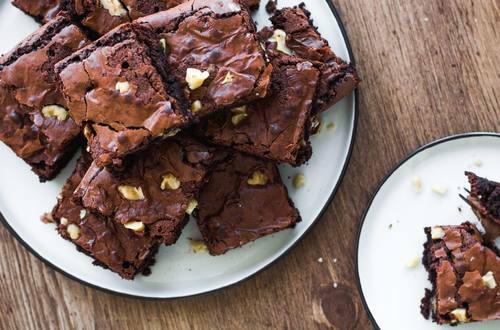 Luxurious brownie recipe, made with walnuts and a touch of Hellmann's® Real Mayonnaise. Once cooked, you will be asked to make these time after time. 1 Preheat oven to 325°F (160°C). Lightly spray 9-inch (23 cm) square baking pan with no-stick cooking spray; set aside. 2 Sift flour, cocoa powder, and baking powder into small bowl; set aside. 3 Microwave chocolate in small microwave-safe bowl at HIGH, stirring occasionally, 30 seconds or until melted; set aside. 4 Beat eggs, sugar and vanilla in large bowl with wire whisk until slightly thickened. Whisk in melted chocolate. Fold in flour mixture, Hellmann's® Real Mayonnaise and walnuts until combined. Pour into prepared baking pan. 5 Bake 35 minutes or until toothpick inserted in center comes out clean. Cool on wire rack. Cut into squares to serve. Sprinkle, if desired, with confectioners sugar.